Today's computer chips pack billions of tiny transistors onto a plate of silicon within the width of a fingernail. Each transistor, just tens of nanometers wide, acts as a switch that, in concert with others, carries out a computer's computations. As dense forests of transistors signal back and forth, they give off heat—which can fry the electronics, if a chip gets too hot. Manufacturers commonly apply a classical diffusion theory to gauge a transistor's temperature rise in a computer chip. But now an experiment by MIT engineers suggests that this common theory doesn't hold up at extremely small length scales. The group's results indicate that the diffusion theory underestimates the temperature rise of nanoscale heat sources, such as a computer chip's transistors. 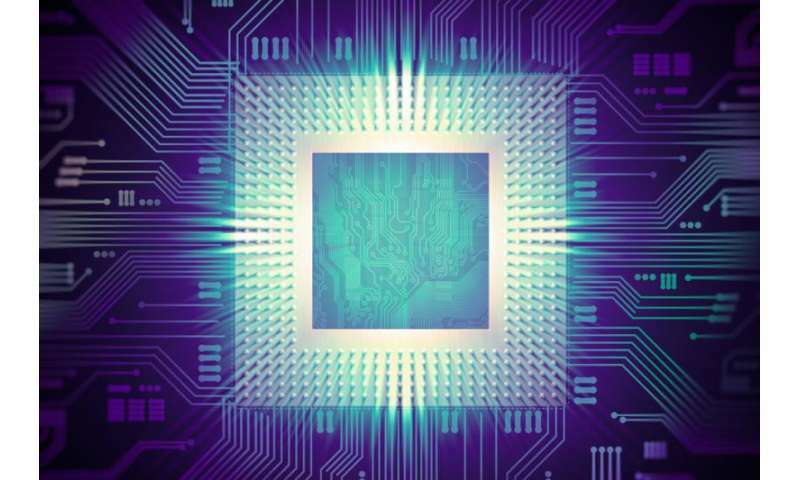 Such a miscalculation could affect the reliability and performance of chips and other microelectronic devices. "We verified that when the heat source is very small, you cannot use the diffusion theory to calculate temperature rise of a device. Temperature rise is higher than diffusion prediction, and in microelectronics, you don't want that to happen," says Professor Gang Chen, head of the Department of Mechanical Engineering at MIT. "So this might change the way people think about how to model thermal problems in microelectronics." The group, including graduate student Lingping Zeng and Institute Professor Mildred Dresselhaus of MIT, Yongjie Hu of the University of California at Los Angeles, and Austin Minnich of Caltech, has published its results this week in the journal Nature Nanotechnology. Chen and his colleagues came to their conclusion after devising an experiment to measure heat carriers' "mean free path" distribution in a material. In semiconductors and dielectrics, heat typically flows in the form of phonons—wavelike particles that carry heat through a material and experience various scatterings during their propagation. A phonon's mean free path is the distance a phonon can carry heat before colliding with another particle; the longer a phonon's mean free path, the better it is able to carry, or conduct, heat. As the mean free path can vary from phonon to phonon in a given material—from several nanometers to microns—the material exhibits a mean free path distribution, or range. Chen, the Carl Richard Soderberg Professor in Power Engineering at MIT, reasoned that measuring this distribution would provide a more detailed picture of a material's heat-carrying capability, enabling researchers to engineer materials, for example, using nanostructures to limit the distance that phonons travel. The group sought to establish a framework and tool to measure the mean free path distribution in a number of technologically interesting materials. There are two thermal transport regimes: diffusive regime and quasiballistic regime. The former returns the bulk thermal conductivity, which masks the important mean free path distribution. To study phonons' mean free paths, the researchers realized they would need a small heat source compared with the phonon mean free path to access the quasiballistic regime, as larger heat sources would essentially mask individual phonons' effects. Creating nanoscale heat sources was a significant challenge: Lasers can only be focused to a spot the size of the light's wavelength, about one micron—more than 10 times the length of the mean free path in some phonons. To concentrate the energy of laser light to an even finer area, the team patterned aluminum dots of various sizes, from tens of micrometers down to 30 nanometers, across the surface of silicon, silicon germanium alloy, gallium arsenide, gallium nitride, and sapphire. Each dot absorbs and concentrates a laser's heat, which then flows through the underlying material as phonons. In their experiments, Chen and his colleagues used microfabrication to vary the size of the aluminum dots, and measured the decay of a pulsed laser reflected from the material—an indirect measure of the heat propagation in the material. They found that as the size of the heat source becomes smaller, the temperature rise deviates from the diffusion theory. They interpret that as the metal dots, which are heat sources, become smaller, phonons leaving the dots tend to become "ballistic," shooting across the underlying material without scattering. In these cases, such phonons do not contribute much to a material's thermal conductivity. But for much larger heat sources acting on the same material, phonons tend to collide with other phonons and scatter more often. In these cases, the diffusion theory that is currently in use becomes valid. For each material, the researchers plotted a distribution of mean free paths, reconstructed from the heater-size-dependent thermal conductivity of a material. Overall, they observed the anticipated new picture of heat conduction: While the common, classical diffusion theory is applicable to large heat sources, it fails for small heat sources. By varying the size of heat sources, Chen and his colleagues can map out how far phonons travel between collisions, and how much they contribute to heat conduction. Zeng says that the group's experimental setup can be used to better understand, and potentially tune, a material's thermal conductivity. For example, if an engineer desires a material with certain thermal properties, the mean free path distribution could serve as a blueprint to design specific "scattering centers" within the material—locations that prompt phonon collisions, in turn scattering heat propagation, leading to reduced heat carrying ability. Although such effects are not desirable in keeping a computer chip cool, they are suitable in thermoelectric devices, which convert heat to electricity. For such applications, materials that are electrically conducting but thermally insulating are desired. "The important thing is, we have a spectroscopy tool to measure the mean free path distribution, and that distribution is important for many technological applications," Zeng says.
" the longer a phonon's mean free path, the better it is able to carry, or conduct, heat." "such [ballistic] phonons do not contribute much to a material's thermal conductivity"
On the surface this is contradictory; ballistic phonons are better at conducting heat and worse at contributing to the thermal conductivity. There seems to be a missing piece of the explanation which is known to the authors but not to me. Help! Download this pdf and look at fig. 5 at page 20. http://arxiv.org/...0532.pdf When heath is diffused it is easier to sink. When there are highly concentrated heat gradients and phonons go ballistic the heath do not diffuse easily; that is what I understand from this.